JAMES GARBARINO, Ph.D. holds the Maude C. Clarke Chair in Humanistic Psychology at Loyola University Chicago, and from 1985 to 1994 he was president of the Erikson Institute for Advanced Study in Child Development. He is a Fellow of the American Psychological Association. Dr. Garbarino has served as consultant or adviser to a wide range of organizations, including the National Committee to Prevent Child Abuse, the National Institute for Mental Health, the American Medical Association, the National Black Child Development Institute, the National Science Foundation, the U.S. Advisory Board on Child Abuse and Neglect, and the FBI. “Teen Hazing Turns Vicious,” “Gang Beats Man Senseless,” “Teenagers Indicted for Murder,” “School Shooter Sought Revenge for Put-downs,” “Youth Arrested in Murder Plot Aimed at Parents.” The headlines don’t seem remarkable: juvenile violence has always been with us. What is new is that these stories aren’t about boys, they’re about girls. Just ten years ago, almost ten boys were arrested for assault for every girl. Now the ratio is four to one, and it’s dropping rapidly. What’s going on with American girls? See Jane Hit is the first big-picture answer to this crucial question, a groundbreaking examination of this hidden epidemic by one of America’s most respected authorities on juvenile violent aggression. In See Jane Hit, Dr. James Garbarino shows that the rise in girls’ violence is the product of many interrelated cultural developments, several of which are largely positive. Girls have learned to express themselves physically in organized sports—thirty years ago, the number of boys playing organized sports was more than ten times greater than the number of girls; now we’re almost at 1:1. In a number of other ways, too, the cultural foot binding that has kept girls from embracing their own physical power has been removed, which is largely to be celebrated. But nothing happens in isolation, and there’s rarely such a momentous societal shift with absolutely no downside. One problem is that girls aren’t being trained to handle their own physical aggression the way boys are: our methods of child-rearing culture include all sorts of mechanisms for socializing boys to express their violence in socially acceptable ways, but with girls we lag very far behind. At the same time, the culture has become more toxic for boys and girls alike, and girls’ sexuality is linked with violence in new and disturbing ways. Ultimately, this brilliant, far-reaching examination of physical aggression and the “new” American girl shows us there is much we can do differently. See Jane Hit is not just a powerful wake-up call; it’s a clear-eyed, compassionate prescription for real-world solutions. In this powerful and practical book, Dr. James Garbarino, renowned author of Lost Boys, and child advocate Claire Bedard offer both a tough-minded, compassionate vision of why “bad things happen to good parents” and solutions for mothers and fathers who are ready to become stronger forces in their children’s lives. A handful of children make headlines by waging war against their schools and peers, but there are millions of troubled boys and girls who don’t go to such extremes. All the same they make life hell for their families, not always intentionally and not because they are rebelling against parents who are neglectful or abusive. Why? Because parents are imperfect and some kids simply are hard to raise. Confidential surveys reveal that 20 percent of American parents say they have a child at home who is so difficult it is nearly impossible to lead a normal life. Working hard and raising the kids in a good community aren’t enough anymore; there are too many other influences. To regain control, parents must first see clearly the many forces at work both around their families and within themselves. Parents Under Siege advises parents how to become better observers of their own thoughts, feelings, and behaviors—a key to becoming more astute observers of their children’s public and secret lives. The authors help parents to take a step back and examine their child-rearing practices. Do they teach confidence rather than fear? Do they create structure and authority within the family and align positively with outside authorities? Do they harness their greatest strength—the capacity for connection and spiritual growth? Drawing upon their twenty-five years of experience in research with children of all ages and their families, and dozens of interviews with parents from across the country conducted specifically for this book—including the only face-to-face conversations with the parents of Columbine school shooter Dylan Klebold—the authors provide a realistic and sympathetic look at parenting in today’s world. 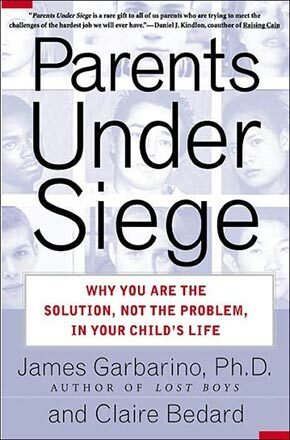 Parents Under Siege offers an imaginative “parenting toolbox“—deeply grounded and effective strategies that will help parents deal with difficult, even “impossible” children, find positive paths for development in face of the toughest challenges, provide alternate views to media violence and the Internet, and raise spiritually grounded children. A must-read for all parents, Parents Under Siege offers practical, inspirational advice for cultivating the mindfulness and observational skills that great parenting demands. By James Garbarino, Ph.D. and Ellen deLara, Ph.D. Despite the best intentions of school administrators, educators, and parents, many high schools—even those that have addressed bullying and are considered safe—unwittingly support and enable hostile and threatening environments. As a society, we are only just beginning to understand the degree of damage that bullying inflicts on individual teenagers and on their relationships later in life. In this groundbreaking work, James Garbarino, the bestselling author of Lost Boys, and Ellen deLara uncover the staggering extent of emotional cruelty and its ramifications and counter the nursery rhyme that words don’t hurt. Through hundreds of interviews, the authors provide a direct word-for-word view into the thinking of adolescents and the strategies they use to keep themselves safe during the school day. After more than a decade of relentless increase in the urban war zones of large cities, violence by young boys and adolescents is on the rise in our suburbs, small towns, and rural communities. Twenty-five years as a psychologist working in the trenches with such children has convinced James Garbarino that boys everywhere really are angrier and more violent than ever before. In light of the recent school-based shootings, it’s now clear that no matter where we live or how hard we try as parents, chances are our children are going to school with troubled boys capable of getting guns and pulling triggers. Beyond the deaths and debilitating injuries that result from this phenomenon are the staggering psychological costs—children who are afraid to go to school, teachers who are afraid of their students, and parents who fear for their children’s lives. Building on his pioneering work, Garbarino shows why young men and boys have become increasingly vulnerable to violent crime and how lack of adult supervision and support poses a real and growing threat to our children’s basic safety. For these vulnerable boys, violence can become normal, the “right thing to do.” Terry, one of the boys Garbarino interviews, says “I just wasn’t gonna take it anymore. I knew I would have to pay the price for what I did, but I didn’t care.” We’ve seen how the deadly combination of ignoring excessively bad behavior and allowing easy access to guns has destroyed families in Pennsylvania, Oregon, New York, Washington, Kentucky, and Arkansas. Fortunately, parents can spot troubled boys and take steps to protect their families from violence if they know what signs to look for—lack of connection, masking emotions, withdrawal, silence, rage, trouble with friends, hypervigilance, cruelty toward other children and even animals—all warning signs that every parent and peer can recognize and report. Dr. Garbarino, whom Dr. Stanley Greenspan of the National Institute of Mental Health hails as “one of the true pioneers in our understanding of the inner life of our youth,” addresses the wide range of issues that boys of every temperament and from every background may have to confront as they grow and develop. By outlining the steps parents, teachers, and public officials can take to keep all children safer, Dr. Garbarino holds out hope and solutions for turning our kids away from violence, before it is too late. This is one of the most important and original books ever written about boys.